This website lists the retro games created by myself, Kevin Thacker. All games are created in my spare time with lots of help from others for graphics and music. I make these games for the fun of it. Some games are for sale and you can buy actual cassettes to load them from, others are offered for free. If you like what I do feel free to make a donation. All donations are appreciated! Blue Angel 69 is a number puzzle game. It is a conversion of the game of the same name for the Amiga and was requested by my friend Markus Hohmann. This game was completed in about 8 months. Started in Februrary 2nd 2010 and finished on October 10th 2010.
where I have included "CAT" art, where text is displayed when CAT command is executed. To make this game I used Z88DK compiler v1.9, CPCRSLib with my modifications, my own libs and Starkos. The graphics in the original Amiga version were heavily inspired, or even directly from the artist Hajime Sorayama. The Amstrad graphics were converted and adjusted from the Amiga version. Sudoku is the game of the classic number puzzle game. This is the first game which has sound composed for the CPC version specifically by a real CPC musician. 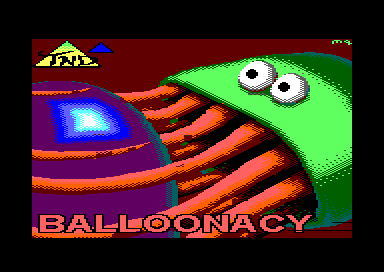 (The tune for Balloonacy was converted from the C64 tune). The initial inception of this game was approximately 3 years ago, and the first version of it started as a Sudoku puzzle solver. The game stagnated for a while because I had difficulty making the Sudoku puzzle creator element of the game, but after finding a reasonable puzzle creation algorithm I started development again. As of 3rd September 2008 the the game is now complete. As of the 21st November 2010 the full version is now free. Amstrad CPC is the lead platform. The final version will be available through Cronosoft. This is an arcade puzzle game. 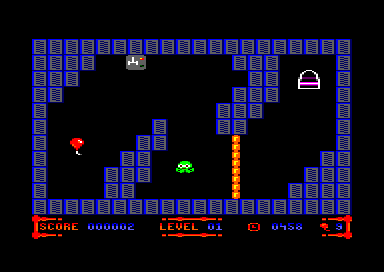 In each level you must move a balloon, first to a switch to open the exit, and then to the exit itself. The idea is simple, but the levels are challenging! As of the 21st November 2010 the full version is now free to download. This version was written for the Amstrad CPC with his permission. The tape version has a Spectrum style loader including coloured bars in the border. It is the first game I have written using this type of fastloader. This is an arcade puzzle game. In each level you must move your character from a starting square, over each square and to the exit. The idea is simple, but there are 32 challenging levels. The original was written by Bob Smith for the Sinclair Spectrum. This is the first game I have completed for the Amstrad computer. This is the Commodore C64 version of Stranded. It was the first game I have written for the Commodore computer and the first I have written in 6502 assembly language. A few days after it's released it was cracked by a C64 demo group. Since then I have lost interest in writing any more C64 games. On The Spot has been developed by Distinctive for use on the Liberate system. The game has subsequently been created primarily for this use but it's great fun to play on the web too! Pheeep, pheep, phheeeeeeep! The final whistle in the World Cup Final blows and it's all over - except the game's a draw. You survived an extra time onslaught from your opponents but have you got the mental skill and calmness of mind to win on penalties? This is your chance, this is you - on the spot. Use your MOUSE and the LEFT MOUSE BUTTON to place six footballs within the grid which lies between the goalposts. Your opponent will also hide six footballs within the grid. Taking it in turns with your opponent you must find the hidden footballs with each one representing a goal. When a goal is scored you get to shoot again without your opponent taking a turn. The first player to score six goals wins the penalty shoot out and a World Cup Winner's Medal. When you take a shot either a football (a goal) or a goalkeeper's hand (a save) will appear. The goalkeeper's hand will give you clues as to the whereabouts of any goals by way of a number in the top left corner of its square. This number tells you how many footballs the hand is directly next to. In the diagram shown on this page you can see that the square has a number two inside it because there are two footballs lying against it. Many thanks to Nigel Little (Owner of Distinctive) for giving me permission to put On the Spot on my website.